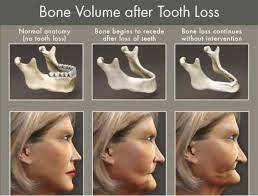 When teeth are lost the supporting bone tends to shrink. This can be exacerbated if you lost the teeth due to infection or trauma as the bone will have been damaged at the time. Furthermore in the upper jaw, the maxillary sinus air space tends to expand after the loss of the adjacent teeth and the sinus pneumatises, so after loss of bone height, a sinus graft procedure may be required to rebuild bone height and enable implant placement as shown in the diagram below. In order to have sufficient bone volume for dental implant replacement of a missing tooth or multiple teeth or even all the teeth missing, Dr Colin Neil BDS, MFDS RCS, MSc (Implant Dentistry), DipDentSed, MSurgDent routinely provides bone and/or sinus grafting to rebuild the bone and gum tissues. This can be achieved using bone and or soft tissue (gum) grafting materials from either the patient themselves (autograft), from another human (allograft e.g. MinerOss or Alloderm), from an animal source (xenograft e.g. Geistlich Bio-Oss and Bio-Guide materials or Biohorizons Laddec and Mem-lok materials) or synthetic source (alloplast e.g. DS Crystal Graft or Fortoss Vital). The decision on what graft material to use is made in conjunction with the patient and any personal preferences can be accommodated. An example of a synthetic bone graft material is Fortoss Vital. You can download a patient information leaflet all about bone grafting and guided bone regeneration around dental implants using Vital by clicking here. Bone and/or sinus grafting procedures can be provided with conscious (IV intravenous sedation for patient comfort and relaxation throughout the surgery treatment.